A couple of weeks ago on a chilly Virginia morning, my brother prepared to climb a ladder to install a security light near his trash receptacles. He’d been recently spooked by a couple of brazen raccoons on his nightly delivery of refuse and recycling and decided to throw a little light on the area. The light in one hand, the drill in the other, he made his way to the top of the ladder concentrating on the impending task. Then without warning, a large bird attacked his back, flapping its wings, attempting to hang on, he believed with talons belonging to one of the several hawks that frequent the yard. He dropped the light and drill, fell to the ground and high-tailed it for his garden house….slamming the door. He peeked out of the windows up toward the trees. Nothing. Noticing movement on the driveway, his eyes widened at the sight of a large American Crow (Corvus brachyrhynchos) marching slowly toward the garden house. My brother cracked opened the door to shoo him away. He didn’t budge. When the crow came too close, my bro closed the door. The crow flew up to the Virginia flag by the door and waited. Poor brother was trapped. Eventually he saw the crow fly toward the bamboo. He didn’t waste a minute. He jerked opened the door and sprinted to the back of the house and the protection of his basement. Whew! A bit later, he nervously finished installing the security light while my brave sister-in-law stood watch by the ladder. That same day, they had a home visit with their insurance representative. They opened the door to welcome her, but she was calling for help as she hurried toward the house with crow on her back, flapping and trying to bite her earrings. My brother grabbed a crab net. Another neighbor who heard the disturbance came to help but the bird was gone again. Later, he glanced out of the window and saw two ladies hurrying down the street with umbrellas on this sunny day. He opened the door and asked if they’d been attacked by a crow. “Yes!,” they replied with gory details of the assault. He joined them as another neighbor shared that she was a witness. Yet another neighbor said that it had been pecking on her kitchen window. Someone else would not get out of their car because of the bird on the windshield. Two terrified children had locked themselves in the home and sent a message to my brother to please kill it. At that moment, something clicked with my brother. He had a light bulb moment, a sudden realization of just what may be motivating the crow’s bizarre actions. He asked one of the neighbors for a slice of bread. She hurried it to him. Without further ado, the crow landed on his arm and my brother began to feed him. 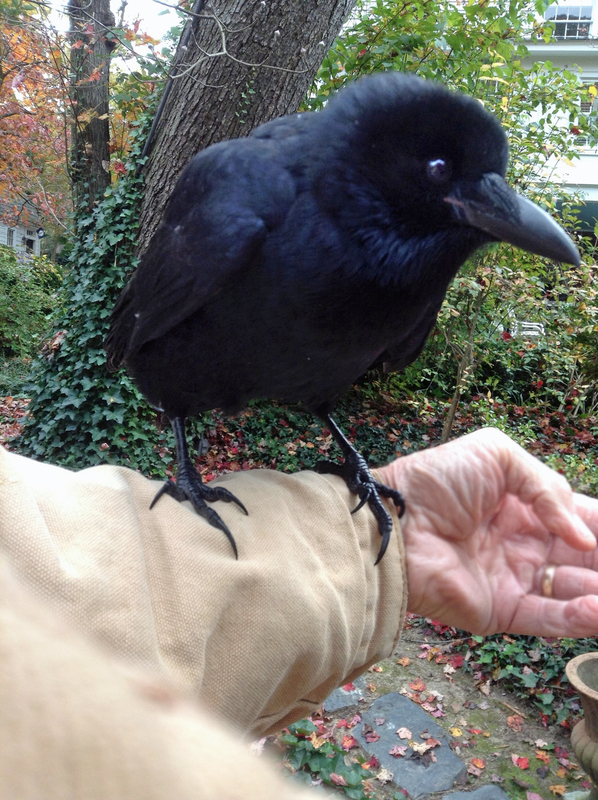 This was a young hand-raised crow that was released or escaped. Sadly, he was imprinted only to humans and could not forage for food. He took the crow home until he could decide what to do. Crow roosted in the garden house that first night, then moved to the basement. They fed him well and for a few days, they and the entire neighborhood, including the children, fell in love with him. The neighbors voted to name him Baldwin after their neighborhood. Baldwin was a lucky crow to land in this neighborhood with a brother like mine who probably saved his life. Personality, brains, playfulness, mischievous, handsome, lovable, and charming were some of the descriptions I heard. He bathed in their creek, he played fetch and tug of war. He had quite a vocabulary and got excited when he heard my brother talking on the phone. He tried to communicate, too, with murmurs, low caws, and clucks. If they could have kept Baldwin, they would have. But it is illegal to keep a crow as a pet and they worried whenever he flew out of sight. So many dangers. Early last week, they made the long drive to Rockfish Wildlife Rescue in Schuyler VA where they had arranged for Baldwin to be acclimated to the wild. But somehow I think that Baldwin will forever live there as their Good Will Ambassador. Of course, he will have his adventures… flying through the forests and soaring over Walton’s Mountain but I’m pretty sure he will always be home for dinner. Click on any photo to enlarge and to learn more about crows, watch PBS’s A Murder of Crows online. 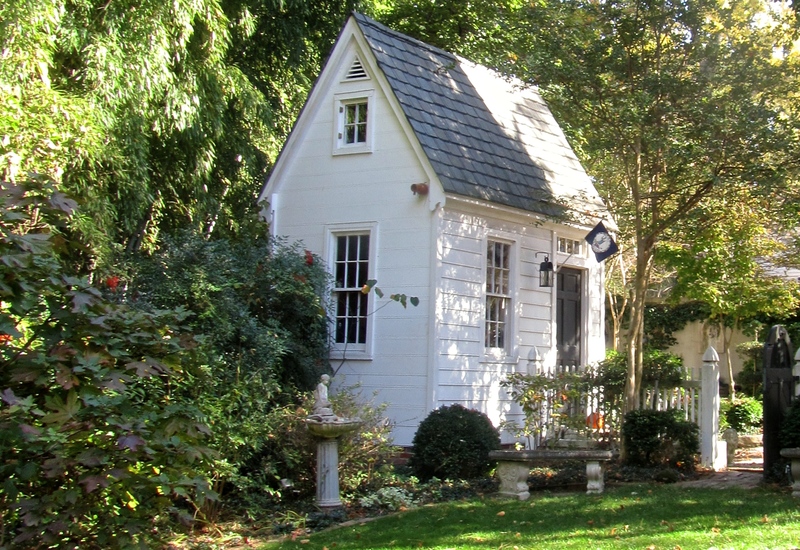 This entry was posted in birds, Horticulture, Nature and tagged American Crow, colonial garden shed, Crow, Rockfish Wildlife Rescue, tinyhouseliving, Virginia by Annie. Bookmark the permalink. The third smartest animal, after humans. And what a beauty! I think everyone has a different view of crows in that neighborhood! It is amazing just how smart these birds are. I learned so much watching the PBS special A Murder of Crows. But I’m also very lucky to have this big brother who gave me a HUGE appreciation of every living thing in the natural world as I grew up. And he is still educating folks! Unbelievable story! He’s so cute! It must have been hard to give him up! I was amazed at how fast they bonded to the young crow. I think the whole neighborhood was sad to see him go. Baldwin was certainly a show stopper! I think most folks would think this was crow gone mad. He was a lucky crow to land where he did. It’s a lovely story. Made me laugh and cry. Awwww… I’m just happy it turned out the way it did. Quite wonderful tale, has me reconsidering the crows that pass through here! Only if they pass through and not stop in the vegetable garden! Well done Bro! …and Annie for telling the tale. This is the bro who brought home goats, geese, reptiles, and more… and thanks to the parents who allowed us to keep them them all. If pressed, I would say the crow is my favorite bird, and there could be many reasons as to why. But I just like them, and really got a charge out of this tale. It takes a personal story to change peoples’ attitudes. I wouldn’t want a tame crow, but I have a whole new respect for them!